Where does social media come into your inbound marketing process? Social media is perfect for getting information out, having a two-way conversation, and bringing research in. The tools in social media can empower your business while you educate, convert, close, and service your customers from the moment they first interact with your company. Conventional marketing focuses mostly on the “getting information out” part of the process, so while social media is useful for all types of marketing, it is especially useful as a tool for inbound marketing, because the open communication of social media lets leads come to you! Once you show leads your content and have them reach back to you through social media, you can convert them into customers, generating revenue for your business that you would have otherwise missed without social media. 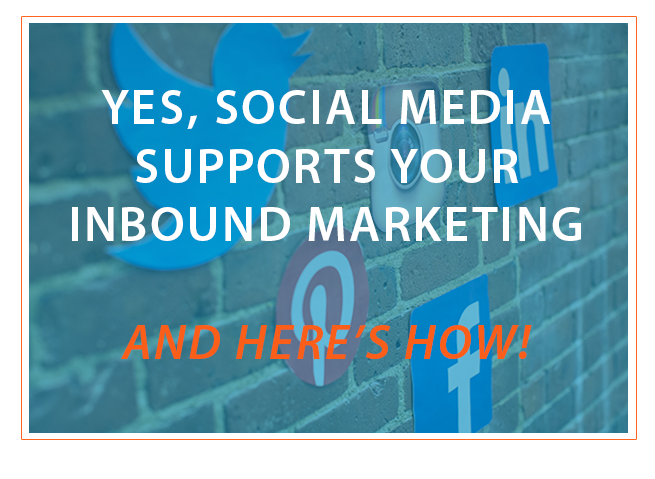 Why is social media so important for your inbound marketing? Social media closes the gap between your content and your potential customer’s everyday experience. If you’re unsure of the outstanding value of social media for inbound marketing, consider that millions and billions of people use Twitter and Facebook daily, and those interfaces might be their only chance for finding your content. In fact, with inbound marketing, social media is often irreplaceable. For example, you can’t have a dialogue with potential customers through a billboard or a static blog page, but you can answer questions on the comments section of your company’s Facebook page. Since inbound marketing relies on the customer seeking answers, you’ve got to have a place for them to go. This is where social media comes in. On social media, customers can interact with your business over time in different ways. To be absolutely clear, if you’re not using social media for your inbound marketing now, you’re not getting the best mileage from your online content. I understand the uses, now what actions can I take to incorporate social media into my inbound marketing? Unify your identity on social media. It’s never too late. Little efforts accumulate to a much better experience for your audience. 2. Research people that fit your buyer personas on places like LinkedIn, then make updates. Look at your Facebook and Twitter followers, and see if you notice anything in common between them. Little details about their likes and needs can help you tailor your marketing and sales strategies to better match the consumer. 3. Follow your industry’s leaders on Twitter, and see what they are posting. If you see a trend on social media, get on board. Real-time feedback gets you ahead of the competitive curve. By subscribing to emails, Facebook, Twitter, and blog feeds from other companies (even competitors,) you have an ear to the ground. See what would appeal to you as a consumer, then add it to your inbound marketing strategy. 4. Search for articles pertinent to your industry that allow comments. Using your branded social media accounts, try to leave short, valuable, public comments. Do not link back to your own products, because your post will probably be banned as spam; besides, on social media, anyone interested can almost always follow your account information back to your page or search for you on Google. Try not to post or comment so frequently that people block your content. Using too much social media can annoy your audience. Many companies have seen success posting to Facebook once or twice daily, and blogging anywhere from once weekly to once daily. If you feel unsure, examine the social media platform you are using and apply the same frequency as other popular companies. Never engage in unprofessional or negative dialogue. If other social media users are publicly saying inappropriate things, or arguing against your company, the best practice is to just say nothing at all. Correcting others or arguing your case will associate your brand with negativity, even if you stand against it. Keep your hands clean, and you can’t go wrong. Be consistent. If you plan on using a social media platform, create a schedule for it. It’s great to adapt and make small changes along the way, but don’t post 15 times in one week, then forget to post at all the next week. People will come to expect your content on a regular basis. Meet and exceed your audience’s expectations, and you will have their loyalty. On the other hand, major changes in content delivery may disappoint your audience. Trends come and go, but luckily for you, human psychology stays about the same! These social media tips for inbound marketing will serve you for years to come. What other ways have you seen social media used successfully or poorly? Can you incorporate that knowledge into your marketing plan? Get our best inbound marketing tips sent right in your inbox!